I was fortunate to meet up with this great group through a friend who saw them in S.C. We found a hole in our schedule and booked them. How very fortunate we were. Just last night they enthralled our small group of folks with a wonderful show and dance music. The community has been buzzing all day about the wonderful time they had with such a great group. They are both so personable and their interaction with the folks was great. To be entertained by two stars who have such contacts with other well known entertainers was just icing on the cake. We all are looking forward to seeing them again in the coming months. Wishing you all the best in 2011 and look forward to having you back to IslandWalk twice in 2012. We are a super busy, super active group of residents, and the community is just so much fun. We have almost every music duo/group possible here for dinner dances as well as indoor concerts. I can honestly say that I haven't had this type of 'rah-rah sis boom bah' response in my seven years here. So bravo to you and keep up the great work. Thank you for a wonderful evening. There are so many factors which combine to insure success. Latitude has them all. Stay well, I will be in touch with you as plans develop for next season. I first saw the Beckers at their John Denver Tribute performance at the Cultural Center Theater, and I was excited by Tom's talent and performing skills. When it came to hiring entertainment for our annual Change of Watch party, I approached Latitude and they agreed to perform for us. I hadn't heard Latitude perform, but I was confident that as a duo they would do a good job. I underestimated the result! Our 150 plus members loved them. The dance floor over flowed into the dining area and everyone had rave reviews. It didn't make me look bad either. I don't know how to classify their music. It's Oldies, TropRock, Beach Music, Romantic, well everything. I recommend Tom and Michelle as Latitude for any party or event you may be planning. You won't be disappointed! It was great having you here at Cinnamon Cove, you and Tom are a great team! Your enthusiasm and love for what you do made our event one of the best we have had since I have been here. Our residents loved the diverse music that was played, and the way you interacted with the guests made all the difference. Michelle and Tom read the participants well, and played accordlingly. Everyone had a great time and loved Lattitude!! We look forward to many more dances with you! We have hired LATITUDE for several of our events and continue to contract Tom and Michelle. They are very professional, prompt and have a great array of music that our members thoroughly enjoy. I would encourage anyone to contract them for any event! We caught your concert at the Venice Theatre yesterday and were blown away! Loved you both - we think you work better together than any husband/wife combo - hope to catch you again when you're here. Hi Tom and Michelle, Again we want to thank you both for an outstanding performance at our mobile home park last evening. I am still getting comments from people like "That was the best show we have ever had here" and "you hit a home run with those entertainers" (from a pastor) as well as "that was excellent clean entertainment" and many other positive comments. Jeanne and I really enjoyed meeting and sharing with you both over our potluck meal as well. Thanks for your willingness to bring us such an excellent program at a price we could afford. We are going to see if we can get a group together to see you at the Venice Theater later this month. Blessings to you both at this joyous season. If you ever get an opportunity to see Tom's John Denver Tribute concert do NOT miss it. We were blessed to see this for the 9/11 evening in Conway, SC last night. Accompanied by the Long Bay Symphony was so beautiful. We have seen Tom and Michelle often and they are so talented. They are also the most gracious of hosts. They are such wonderful people. If you see "Latitude" playing anywhere, don't miss it. You will be so happy you got to hear Tom and Michelle sing. Latitude provided an enjoyable, outstanding show at our Village Walk community. Michelle and Tom shared experiences about various artists, road trips and their lives. They interacted with the audience and had most people dancing in their seats. Have received many accolades about their performance and many requests for their return. Am presently seeking to book them again. Kudos to Tom and Michelle Becker of Latitude for a faboulous afternoon concert at our community. My residents thoroughly enjoyed their performance and are excited for their return for our Valentine's Dinner Dance. If you are considering booking them I would highly recommend doing so, you will be glad you did! Our activities director found an unusual and fun way to encourage residents to contribute to the CAFE OF LIFE charitable organization. Suzi Rees, the activities director at Cascades, set up a free concert in our parking lot. 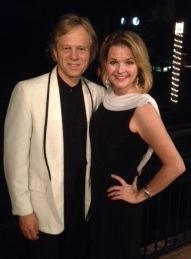 The famous duo, Tom & Michelle Becker, of LATITUDE, was the entertainment. Amazingly, two people and three musical instruments, put on a fantastic concert. Least I forget the other two instruments, their voices. The lady sang with such a range of voices and enthusiasm that I feared she would blow her voice. She played the keyboard with such ease. The man played two guitars and sang beautifully. The sound system was Bose, which overcame the bad acoustics of a "parking lot" stage. It was fun even though it was chilly. They requested, and got, a lot of audience participation. Especially one resident who held a note longer than either of the entertainers. We all wore old favorite winter clothes, and the residents filled a giant tub with donated canned foo. The musical duo of LATITUDE has provided quality music and integrated fun and showmanship in all of their performances at Eagle Crest Retirement over the past 3+ years. We have had LATITUDE as part of our entertainment for large mega events as well as small events and have found them to be excellent with any size group. LATITUDE reflects a positive and upbeat demeanor when it comes to patience and understanding the special needs of people. To watch them interact with the older population is amazing! They have this special rapport with people of all ages and possess excellent communication skills. LATITUDE is dependable, efficient and extremely competent. I would highly recommend them for any venue whether small or large. LATITUDE would be a valuable asset to any organization in need of great musical entertainment! If you have any questions, please do not hesitate to contact me. The National Association of Independent Insurance Adusters has been multiple customers of Latitude (as Headliners at our National Conventions in Tucson, Orlando and Hilton Head) and have always been more than pleased each time. We cannot say enough about the willingness to work with our group and the great performances! We most certainly would utilize their services again. May I please take this opportunity, on behalf of the members of the 20th Century Orthopaedic Association, to express to you our sincere gratitude for the outstanding performance you put on at our recent meeting at Sea Pines. Your selections fit our occasion perfectly and resonated with our members! What a great night: phenomenal music, a perfect temperature, and the moon rising over the Atlantic! With your melodies in the background, we felt we were in the Caribbean! You two are to be heartily congratulated for bringing such enjoyment to our group. Your professionalism shown through and we cannot thank you enough for being with us. Our Saturday evening was a perfect ending to a wonderful week! I would be happy to send to anyone who might ask, my very highest recommendation of your duo....it was a real treat to listen to you! Chairman/Secretary; 20th Century Orthopaedic Assoc. Tom and Michelle Becker that form Latitude are exceptional at not only getting people up and about during their show, they actually bring you in by involving the audience in the song. They even have props for the audience as well as themselves. So you not only get great music, you get an exceptional show as well. Their playlist looks like an encyclopedia. They not only have a range of songs, they do them ALL extremely well. On many of their songs, you could swear it was the artist themselves singing the song. They're THAT GOOD! I've heard a lot of bands up and down the east coast and some on the west coast. Latitude gives you the whole package -- exceptional musical talent, and outstanding voices and harmony. And, you can tell they really enjoy what they're doing. From Buffett to Blues, from Rock to Reggae, from TV Land to Tina Turner. This band has it all and they do it very, VERY well. We asked Latitude to perform at our daughter's marriage reception at Heritage Golf Course on October 14, 2011. The weather was beautiful and we couldn't be more pleased with the music performed by Tom and Michelle. They played all of the bride and groom's favorites from a very large repertoire of music and everyone was dancing and having a great time. Thanks Tom and Michelle you two are fabulous performers. Latitude played at our wedding on May 26, 2011 in Captiva Island, FL. We had previously heard them in concert as well as listened to their CDs, but their performance at our wedding, far surpassed our exceptations. They were engaging and helped truly make the evening a wonderful experience for all! As Park Ranger at Huntington Beach State Park, for many years I have been in charge of the entertainment for the Atalaya Arts and Crafts Festival, a very large event with thousands of visitors. We hire four bands to perform over the 3-day event and all of them do a very good job for us. We have been very impressed with a band called Latitude. For the past 3 years, the quality of the performance has been outstanding and they work very well with the other performers and sound stage director. My supervisors and I are very pleased and we would highly recommend them for any event. Latitude has been a feather in my hat as entertainment organizer and my supervisors have taken notice. I am sure that Latitude will be invited to perform at upcoming events in more of the South Carolina State Parks, as well as next year's festival. We hope your event planning will be as smooth as ours has been, thanks in part to Latitude's professionalism. Tom and Michelle Becker, whose group is known as Latitude, began performing poolside around Easter. They are talented, professional musicians who play a huge variety of music. We have enjoyed everything from Under the Sea from the Little Mermaid to Jimmy Buffett to Bob Marley to the YMCA by the Village People (and everything in between!) What I enjoy most, and the guests truly enjoy, is that they do not merely provide music, they provide engaging entertainment. They conduct hula hoop contests, limbo contests and conga lines. Everyone at the pool deck is up and dancing (adults and children alike). Tom and Michelle are outstanding at engaging the guests. They are also excellent at tailoring their performance to meet the expectations of the audience. If you are looking for entertainment that is fun for all ages, don't hesitate. You won't be disappointed! Latitude is always a favorite for our downtown outdoor concert series "Fridays at the Plaza". Tom and Michelle are both very talented musicians but it doesn't stop with just talent. They also do an outstanding job of engaging the audience in their show and their varied selection of music is a hit with all ages. We asked Lattitude to perform at our daughter's marriage reception at Heritage Golf Course on October 14, 2011. The weather was beautiful and we couldn't be more pleased with the music performed by Tom and Michelle. They played all of the bride and groom's favorites from a very large repertoire of music and everyone was dancing and having a great time. Thanks Tom and Michelle you two are fabulous performers.